We’d love your help. Let us know what’s wrong with this preview of Hana-Kimi (3-in-1 Edition), Vol. 2 by Hisaya Nakajo. What happens when the hottest boy in school is a girl?!? Mizuki Ashiya has such a crush on a track star named Izumi Sano that she moves from the U.S. to Japan to enroll in the all-male high school he goes to! Pretending to be a boy, Mizuki becomes Sano’s roommate…but how can she keep such a big secret when she’s so close to What happens when the hottest boy in school is a girl?!? Mizuki Ashiya has such a crush on a track star named Izumi Sano that she moves from the U.S. to Japan to enroll in the all-male high school he goes to! Pretending to be a boy, Mizuki becomes Sano’s roommate…but how can she keep such a big secret when she’s so close to the guy she wants? 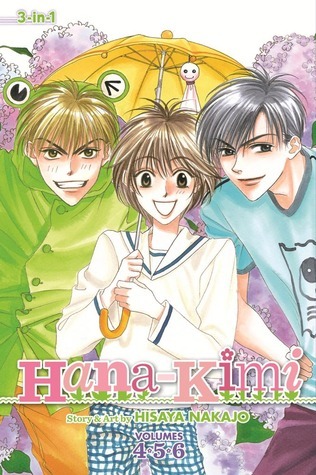 To ask other readers questions about Hana-Kimi (3-in-1 Edition), Vol. 2, please sign up. I liked this three volumes in one book but if they had been separated out into three separate volumes the rating would have been lowered for sure. There were a lot of flashbacks which I generally don't mind but I felt like the flashbacks could be taken out and the story would still make sense. To me they were almost just fillers to lengthen the book. Nakatsu doesn’t care anymore, he just wanna confess and let his feelings all out already. Whether everybody thinks he’s gay or not, but ofc he’s straight, it’s just that Mizuki can’t hide all her feminist. And, as for Sano. He’s too cute, for all of these. Mizuki disguises herself as a boy in order to enrol in an all-boys boarding school. Why? To help inspire her idol, Sano, to high jump again. So this volume (three volumes?) diverges much more from the drama, and I'm really glad with the direction it's taking. I'm really interested to see where the story goes next, particularly with the cliffhanger at the end! The first volume in this collection deals with the school festival. It seemed to be a bit more of a filler volume, though there is some int Mizuki disguises herself as a boy in order to enrol in an all-boys boarding school. Why? To help inspire her idol, Sano, to high jump again. The first volume in this collection deals with the school festival. It seemed to be a bit more of a filler volume, though there is some interesting character development. The next two volumes (whilst also dealing with the conclusion to the school festival) seem to focus much more on Nakatsu and his feelings for Mizuki, which I loved. It's really interesting to read a character in a manga struggling with his sexuality, even though we as the audience knows that Mizuki is really a girl. I feel like it must have been somewhat groundbreaking at the time the manga was written in the mid-1990s (though that's pure speculation). The characters continued to grow and develop in this one, and I liked the fact we got a bit more insight into Minami (he's a much bigger character in the drama, but I still really like him). We also got to see more of Julia, but my opinion on her is divided at the moment. I continue to like Sano more and more, and I can't wait until he reveals he knew Mizuki was a girl all along (though that'll probably happen in the last volume or near the last volume... but it's got to happen). He is a really sweet character, though I feel there is still a lot of mystery to him. I'm intrigued to know more (and I'm sure we'll learn more in Hokkaido). I think my favourite character might be Umeda though. I'm not sure why. I think it's the fact he's faintly inappropriate. There are two short stories in this collection as well. The first, 'Thirsty Moon', is not related to Hana-Kimi but is an entirely separate story. It's about a girl who doesn't really want to marry her fiancé and who meets a mysterious boy. It's interesting, but the ending is a little abrupt for my liking. Like the story in the first collection, I feel that it would have done much better if it had been a series/volume on its own. The second story is about Minami, and his past love, Kanako. As I said above, I really enjoyed the insight into Minami's character. It kind of makes you understand why he is the way he is. I enjoyed seeing him with shorter hair! I'm loving these 3-in-1 volumes even more now. A single volume of manga doesn't really take that long to read, so, for some reason, the fact it takes longer to read this one book (even though it's three volumes) really makes me feel like I'm getting my money's worth. And they take up less space. Still very hilarious and I am hooked. I really enjoy this series very much. I cannot believe it was made in 96-97. I really enjoyed the "Whispered Secrets" section with the author. She let's you into her world, her interests and special tidbits on the characters. I have to admit I love the school Dr. Umeda. He's just sarcastically hilarious and doesn't feel bad about it. This volume took on a love triangle which only adds discomfort for Mizuki! This series is still awesome and I cannot wait to r Still very hilarious and I am hooked. I really enjoy this series very much. I cannot believe it was made in 96-97. I really enjoyed the "Whispered Secrets" section with the author. She let's you into her world, her interests and special tidbits on the characters. I have to admit I love the school Dr. Umeda. He's just sarcastically hilarious and doesn't feel bad about it. This volume took on a love triangle which only adds discomfort for Mizuki! This series is still awesome and I cannot wait to read the next one. I've had this book on my shelves for such a long time! I'm really glad I read it. This series is adorable and hilarious, the main character always makes me laugh. Basically it's about a girl named Mizuki, who transfers to an all boys school. The reason she goes there is so she can support her favourite high jumper, so she's gotta disguise herself as a boy and chaos ensues. It's heart warming and makes me laugh, I really like this series. I really am liking this manga. I think I'll stick with it. Such a cute series! Love it.